The name of Alessandro Stradella has been mostly associated with popular aria Pietà Signore (which was falsely attributed to him), or to the opera Alessandro Stradella by Friedrich Flotow inspired by Stradella's adventurous life. All this has nothing to do with the opus of one of finest Italian composers of the Middle Baroque era. Sinfonia a tre, a short work of four contrasting movements, is a wonderful example of his style. Originally written for two violins and figured bass, the music has a certain choral quality with maestoso openings of slow movements and masterful, transparent counterpoint throughout the piece. Not very technically demanding, the Sinfonia could well lend itself to a larger cello choir, without the risk of sounding too heavy. 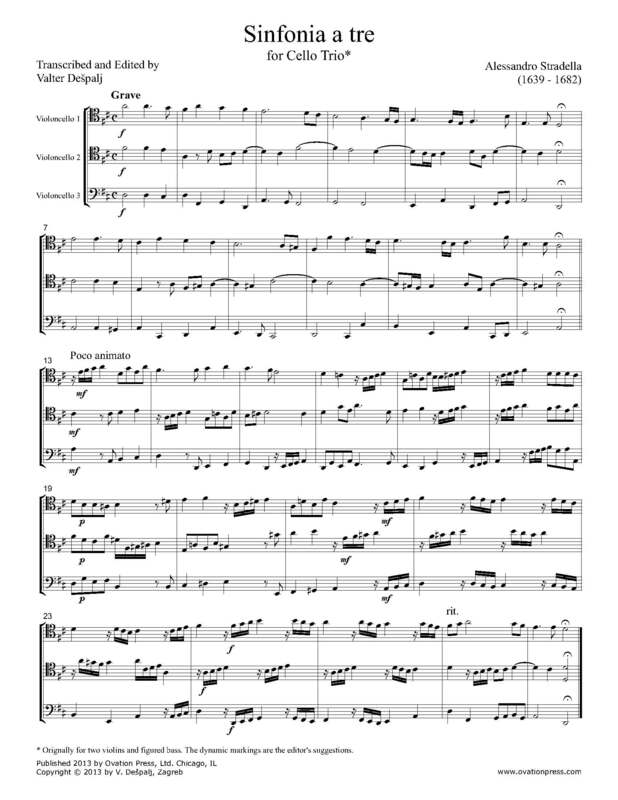 Therefore this transcription includes a supplement for cello octet formation (3+3+2) containing an alternative version of the second movement with usage of responsorial effects. Click below to watch a video of Valter Dešpalj's students performing his arrangement of Alessandro Stradella's Sinfonia a tre.